Gizmodo readers can get favorite apps Parallels, Snagit, Typinator, Boom, Jump Desktop and more in this Summer Mac Bundle. 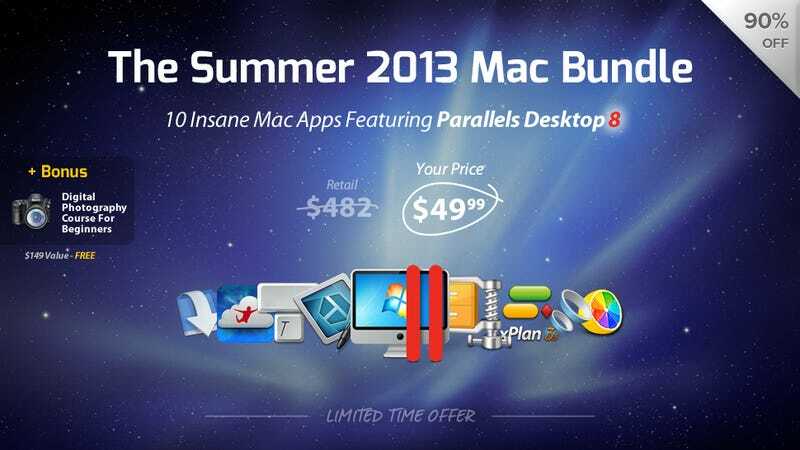 Parallels alone is normally $80, but now you can get it and 9 other popular Mac apps for only $49.99. Parallels: Lifehacker's #1 app for virtualizing Windows on your Mac. Snagit: Record screen videos and enhance images with the ultimate screen capture tool. Typinator: Automatically "types" frequently used text for your. Great productivity tool. Boom For Mac [a personal favorite]: Very solid volume booster and equalizer. WinZip Mac Edition 2.0: Zip and unzip to save space and share files faster. xPlan: An intuitive take on project management. Jump Desktop: Remote desktop application. Allows you to securely connect and share with any computer in the world. Leap: Easily find, browse, & organize important documents. ColorStrokes: Great tool for selective color photography. sBlaster Freebie [separate redemption required - see below]: Record the audio output of any application on your Mac. Bonus Content: Digital Photography for Beginners eLearning course: available to first 10,000 buyers. Redemption: Upon completing the purchase at StackSocial, you'll be able to immediately download the entire contents of the bundle. You can find the separate redemption for the sBlaster freebie here or on the bundle sale page below the big "buy now" button.